"When I watch the mountains I feel mountain feelings inside of me. I feel them as well as Beethoven, who heard the sounds of his mind when he was deaf and composed the Ninth Symphony. The rocks, the sides and the climbing are just an artwork." 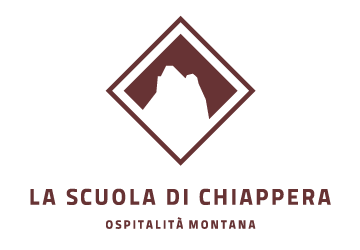 The school of Chiappera represents an innovative tourism offer which employs the concept of Diffused Hospitality, where the tourist becomes a temporary inhabitant of the hamlet. The keystone of our project is the Alpine Hospitality, spread inside the hamlet of Chiappera, thanks to which we give the chance to benefit from different types of accommodation and activities. It is indeed possible to stay either in the School rooms or choose between one of the houses in the hamlet to live an authentic alpine experience dip in the core of nature and local habits. Our proposal goes towards an ecologically sustainable tourism, reached through the esteem of what we define as the "Alpine Hospitality" of Chiappera: a hospitable offer (rooms, restaurant), reception services (information point, activities and hobby) and common areas to enjoy the beauty of this landscape, all held inside a unique coordination that refers to the School. A building of great historical importance is the main office of our Alpine Hospitality: it’s here indeed where the reception, the kitchen, the dining room and the meeting room (for moments of meeting, dialogue and reading) are located. Its architecture is still the typical one of the old primary school, revisited under an emotional and modern point of view, in memory of an important life period that everyone of us has experienced.